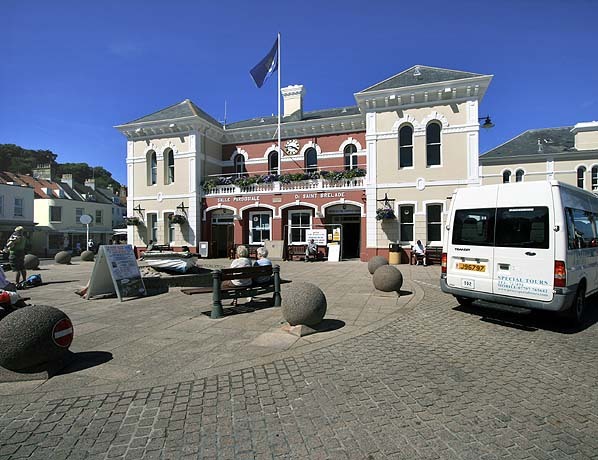 Present state: The main station building and Terminus hotel are extant and now used as the St. Brelade parish hall. 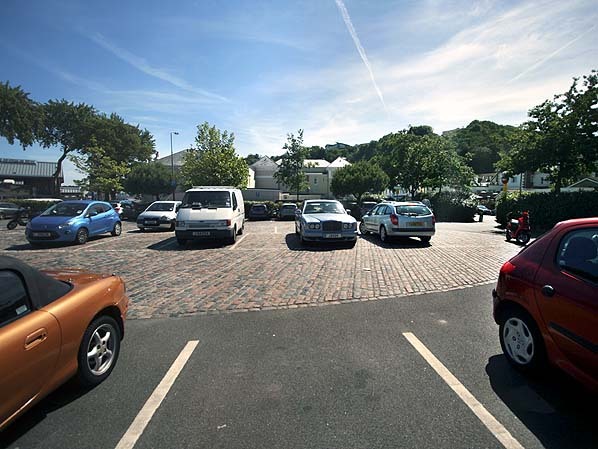 The areas occupied by platforms 1 & 2 is now a car park and the site of platform 3 is a road leading to the car park. Notes: St. Aubin station was the western terminus of the line. When it opened in 1870 it had a curved overall glass trainshed roof similar to that at St. Helier. There were two platforms but only platform one on the up side was generally used and a crossover was provided to allow locomotives to run round their train. after opening it was stated that the railway carried over 9,000 passengers. It's popularity was however short lived and it was running at a loss. Corbière. 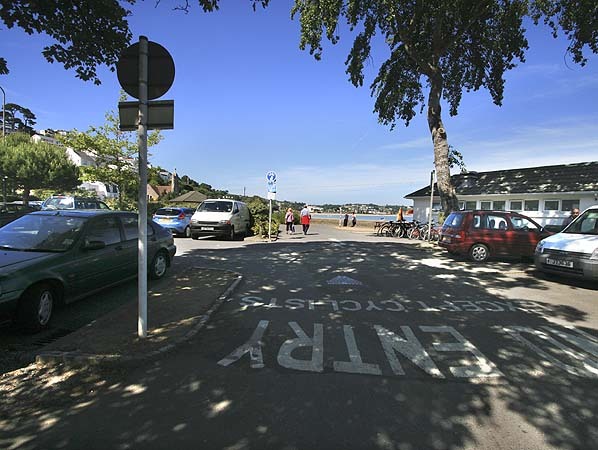 The extension opened to a temporary terminus near St Aubin hospital on 30th August 1884 with platform 3 opening on 5th August 1885 with some through trains the running from St. Helier to Corbière. After leaving St Aubin, the railway turned sharply inland through a rock-lined tunnel and climbed steeply away from the sea. demolished and replaced by canopies over both the platforms and concourse. 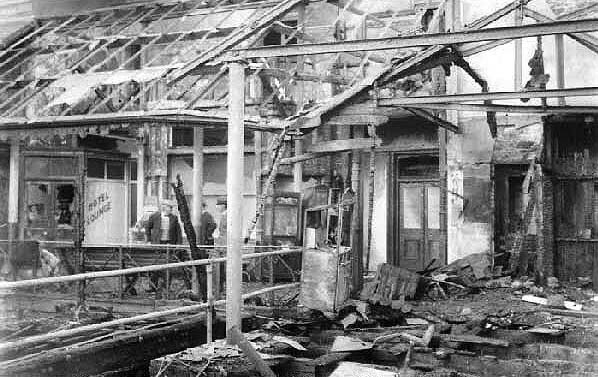 The station was badly damaged in a fire on 15th October 1936 which broke out in a butchers shop in the front of the stations. Five shops, the station roof and all the rolling stock that was stored in the two platform roads were destroyed and the Terminus Hotel badly damaged. Although the town is called St. Aubin the station was also sometimes known as St. Aubins and was always shown on St. Aubins on tickets. 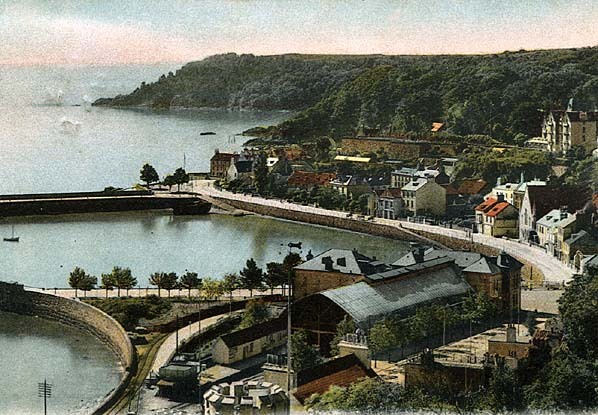 Looking south at St. Aubin c.1905. The station is seen in the foreground. 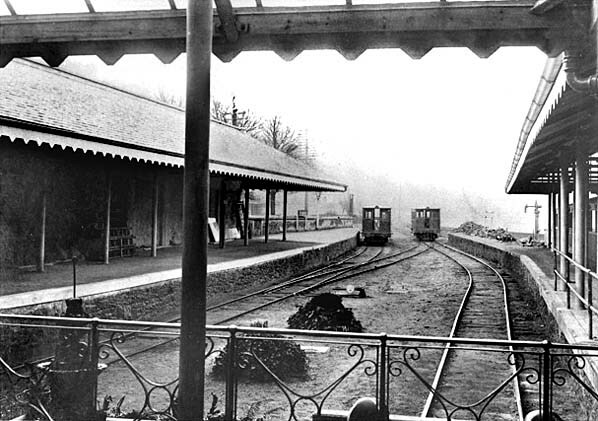 The original terminus with its trainshed roof is to the right with the extension platform to the left from where the line curves round the front of the station building to enter the St. Aubin tunnel out of view to the right. Loco No. 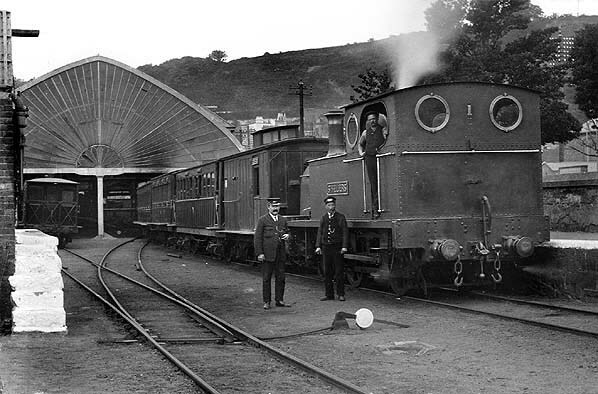 3 'Corbière' waits in platform 3 at St. Aubin c.1905. Platform 3 opened in 1900 when the line was extended to Corbière. 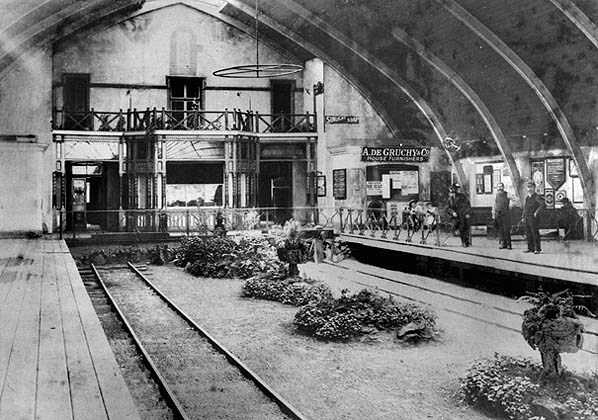 Platforms 1 and 2 at St. Aubin station in 1922 shortly before the trainshed was removed. 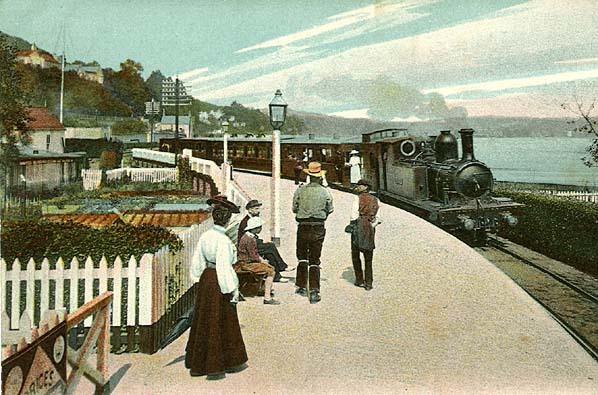 'St Heliers' stands at platform 1 with a train bound for St. Helier. A water tank can just be made out at the end of platform 2 on the left. photo above are still there. 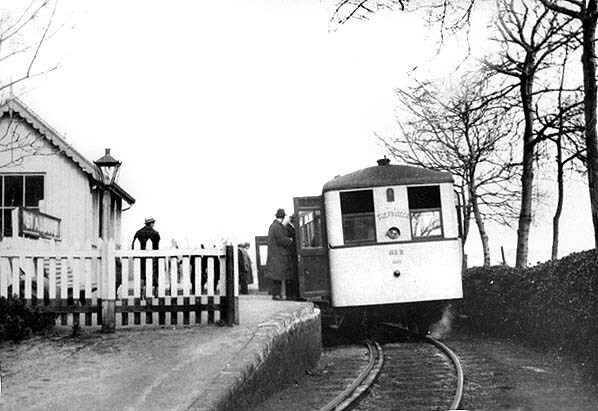 Sentinel-Cammel railcar waiting at the extension platform at St. Aubin c.1930s. The site of platforms 1 and 2 at St. Aubin station in June 2010 looking towards the station building which can be seen behind the trees in the middle distance. St. Aubin station in June 2010. The building now acts as the St. Brelade parish hall. The Corbière line came from the right across the front of the building.